“My heart is with the many people who have lost everything and will be spending the months ahead trying to pick up the pieces," Facebook COO Sheryl Sandberg said Friday. Tech companies — including Airbnb, Google, Facebook and Microsoft — are devoting resources and providing digital tools to assist first responders and people affected by the ongoing wildfires in California, which are now the deadliest on record. Airbnb announced Monday that it will be working to accommodate relief workers and displaced victims, free of charge, through its Open Homes Program. The program, which started back in 2012 with Hurricane Sandy, facilitates temporary housing options though the site's many hosts. “I think in moments like this, the images are so devastating and we can all feel a little helpless and we can all help," said Kim Rubey, Airbnb's head of social impact. 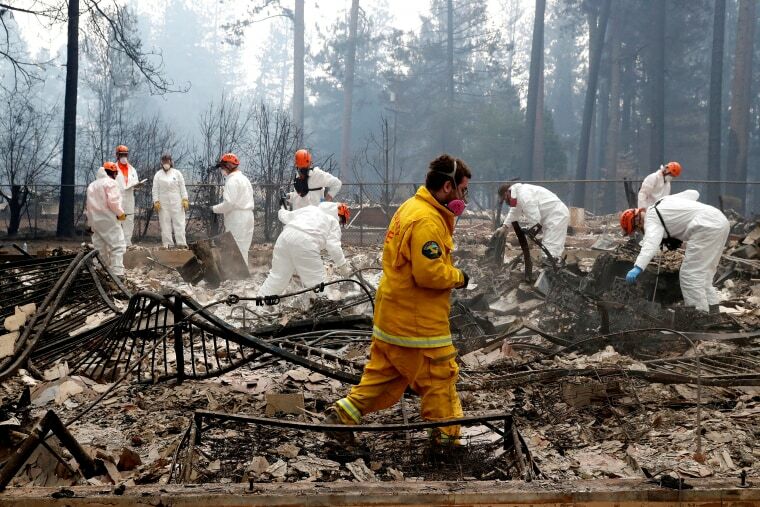 Thousands have been forced to flee their homes from the wildfires that have consumed more than 208,000 acres of land and killed at least 42 people, according to safety officials. Rubey said Airbnb will be waving host fees and providing services like 24-hour support to all those who have chosen to offer up their homes in the region. The company spokesperson said close to 1,500 hosts signed up to help as of Tuesday afternoon. "Ultimately, it's a very important and tangible way to help everyone who has been affected by these fires these last couple of days," she said. As firefighters in the region work to contain the flames, companies like Google and Facebook also said they are customizing their tools to keep up with information demands on the areas affected. Google spokesperson Marika Olsen said the company is continually updating its Crisis Maps to pinpoint fire boundaries and its navigation app Waze to show issues like road closures. As of Tuesday evening, Waze data estimated 71 roads closures as a result of the Woolsey Fire. Google has also committed to donate $500,000 to organizations assisting evacuees and will match donations by users who use the platform to give money. "The devastation we are seeing from these fires is heartbreaking," said Hector Mujica, Google's crisis response manager. Facebook, which frequently monitors devastation among its global users, created two different Crisis Response pages for the Camp and Woolsey Fires and has activated “safe” status buttons for people in the area. The company will also donate $250,000 to the American Red Cross and match up to another $500,000 of donations made, according to Facebook spokesperson Aften Meltzer. Microsoft, which is headquartered in Seattle, said it's also looking for ways to help. While Apple has not released an official statement, CEO Tim Cook tweeted last week that the company is working to assist those in need. "Praying for the safety of our neighbors, loved ones and all those affected by the rapidly spreading fires in California," Cook wrote. "We’re grateful to the firefighters and first responders working to keep everyone safe. Apple is donating to relief efforts for Northern & Southern California." Apple did not immediately respond for comment on exactly how much the company will be donating or what organizations will be receiving donations from the company.